Don't let little germs cause big problems. Is there anything worse than jumping into a bounce house expecting to have fun, only to discover that the inflatable is filthy and disgusting inside!? Unfortunately, far too many inflatable rental companies neglect to properly take care of their units, which leads to them becoming a breeding ground for bacteria and other illnesses. We have the solution! The Bounce Barn has partnered with Clear Gear; a safe, water-based, EPA approved disinfectant spray, that is specifically engineered to deodorize and kill infectious bacteria and viruses. 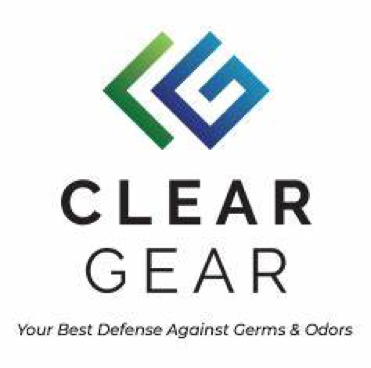 Clear Gear is a ready-to-use disinfectant spray, that is a unique EPA-approved formula that kills over 100 germs and viruses including MRSA, Staph, Strep and is also effective against influenza, athletes foot, ringworm, mold, and mildew. In addition, Clear Gear deodorizes, cleans and is an effective fungicidal and virucidal. Clear Gear's ready-to-use formula begins working immediately, and the inflatables will be ready to use once it is dry. Since Clear Gear is a safe water based product, it causes no skin irritation or any corrosion on the inflatables. It's easy and we spray on Clear Gear before and after each use and let it dry. This is when Clear Gear goes to work by killing dangerous bacteria and inhibits the growth of mold and mildew. It is a one-step disinfectant cleaner and deodorizer that is a virucidal and fungicidal, and it is effective against a broad spectrum of bacteria. CLEANS - Cleans surfaces leaving no residue and there's no need to wipe. Just spray and let air dry. DEODORIZES - Clear Gear removes odor-causing bacteria and mold and leaves our equipment smelling fresh and clean. DISINFECTS - Anti-viral, anti-fungal formula kills mold, mildew, staph, MRSA, influenza, athlete's foot, and more. It eliminates infectious and odor-causing bacteria. INGREDIENTS - Alkyl (50% C14, 40% C12, 10% C16), Dimethyl Benzyl Ammonium Chloride 4.0%, Octyl Decyl Dimethyl Ammonium Chloride 3.0%, Didecyl Dimethyl Ammonium Chloride 1.5%, Dioctyl Dimethyl Ammonium Chloride 1.5%, OTHER INGREDIENTS 90.0%. The Bounce Barn's promise to you is clear! By using Clear Gear, we will keep our inflatables cleaner than the rest! For a complete list of pathogens that Clear Gear protects you and your family from, see the chart below.